New Delhi (AFP) – It’s early morning but already “Medicine Baba” Omkarnath Sharma is pounding the pavement in one of New Delhi’s upscale neighbourhoods, collecting the wellheeled’s leftover pills, capsules and syrups. Like a modern-day town crier, the 79-year-old calls to residents to bring out their medicines, rather than throw them away, to donate to the Indian capital’s millions of desperate poor. “All of us have some medicines lying around in our houses but we end up throwing them in the dustbin,” said Sharma, whose affectionate title means wise man. Sharma is hopeful his unorthodox service is making a difference, albeit small, in a country where 65 percent of the population lacks regular access to essential medicines, according to the World Health Organisation. 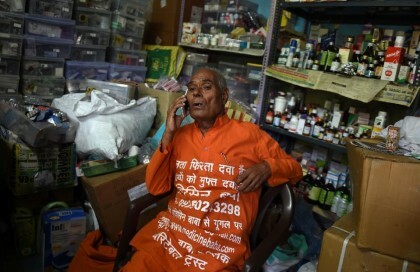 In his trademark bright orange smock, Sharma cuts a familiar figure in Delhi’s leafy neighbourhoods, and residents routinely carry out handfuls of medicines for him. “This idea struck me a few years back when I saw how the poor struggled to buy medicines. When I first started, I was ridiculed and called a beggar but now people respect what I am doing,” he said. Medical treatment is free in Indian government-funded hospitals, but drug supplies at their dispensaries run out, forcing patients to fork out for medicines at nearby chemists. Overburdened public hospitals blame a lack of resources, saying they can only budget a certain amount for medicines, with funding stretched across the board. At his rundown Delhi home, Sharma painstakingly checks and sorts his haul that includes everything from calcium tablets to antibiotics, before the queues form outside. India spends just 1.3 percent of its gross domestic product (GDP) on health, according to a 2013 World Bank report, lower than war-torn Afghanistan on 1.7 percent. “The health care costs have increased greatly over the years,” said doctor S.L. Jain, as he examined a newborn at his charity clinic that receives some of Sharma’s medicines. “So many people do not seek treatment simply because they do not have the money to pay for medicines,” he said as mothers line up clutching their sick babies. More than 60 percent of the population’s out of pocket expenses for health are for medicines, according to government estimates. With her carpenter husband earning just 5,000 rupees ($77) a month, mother-of-four Pushpa Kamal fears for the future of her family as she waits at the clinic for treatment. India’s generic drugs industry is a major supplier to the world of cheap, life-saving treatments for diabetes, hypertension, cancer and other diseases. But experts say even these are out of reach of many of the 363 million Indians living below the poverty line, who make up about 30 percent of the country’s mammoth population. “There are hardly any checks and balances because health is unfortunately not a priority in our country,” said Ajay Lekhi, president of the Delhi Medical Association. “Consumers are highly vulnerable as their requirement is urgent and they are not in a position to compare prices or bargain,” he told AFP. Prime Minister Narendra Modi, who swept to power at elections last May, promised in his poll manifesto to introduce an ambitious universal health care plan that assures free drugs and insurance for serious ailments. But the plan, pegged initially at $26 billion over the next four years and envisioned to be fully operational by 2019, has been pushed back because of budget constraints. A senior health ministry official said the scheme, with a planned roll out from April this year, was now on the back burner. Jagdish Prasad, director general of health services, acknowledged the problem facing those living on the margins, and that the government needed to do more. “People are spending 60 to 70 percent out of their pockets for purchasing medicines which is a great burden for the poor,” he told AFP.